Sadly, the film's logic roughly matches the special effects. The script is cheap, but at no time do the actors treat it as anything but dead serious. There's a lot of nothing that happens. I probably shouldn't be picky about the logic of my movies. After all, Godzilla is a giant, walking dinosaur with radioactive heat breath. I'll stretch my suspension of disbelief pretty far, given a good set-uo. But a gigantic space bird that's not actually a bird while having an antimatter shield kind of hurts my brain. Even if it chows down on the Empire State Building and the United Nations. It's bad. And I've already given it more time and attention that it deserves. 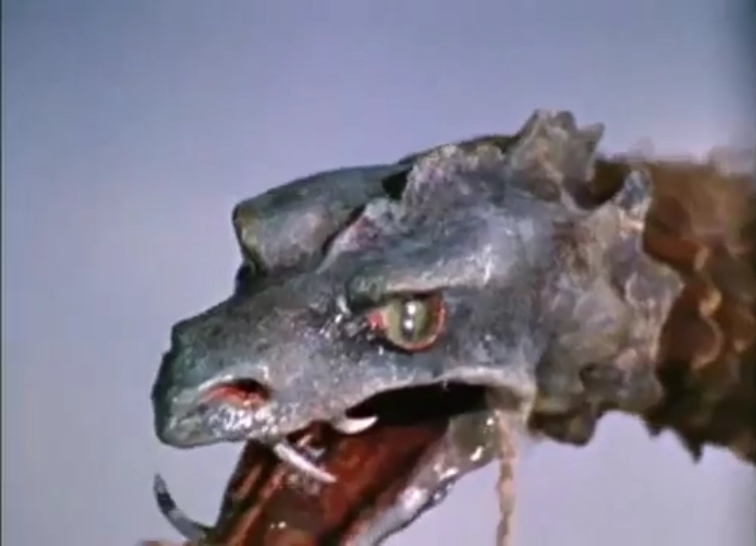 The 1961 Reptilicus, on the other hand, is a lot more interesting. 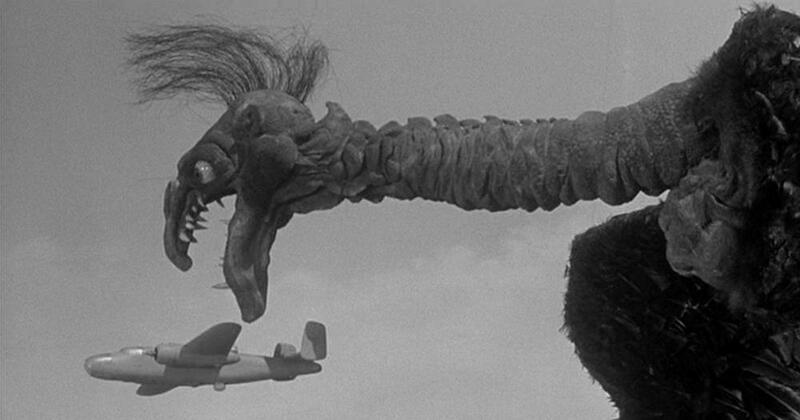 The only kaiju film made in Denmark, Reptilicus is a significant departure from giant monster films of the past. While Reptilicus is a unique, unprecidented dinosaur-like creature, we do not initially encounter it full-size, or as the result of radiation. Reptilicus is discovered by a team of prospectors searching for copper. 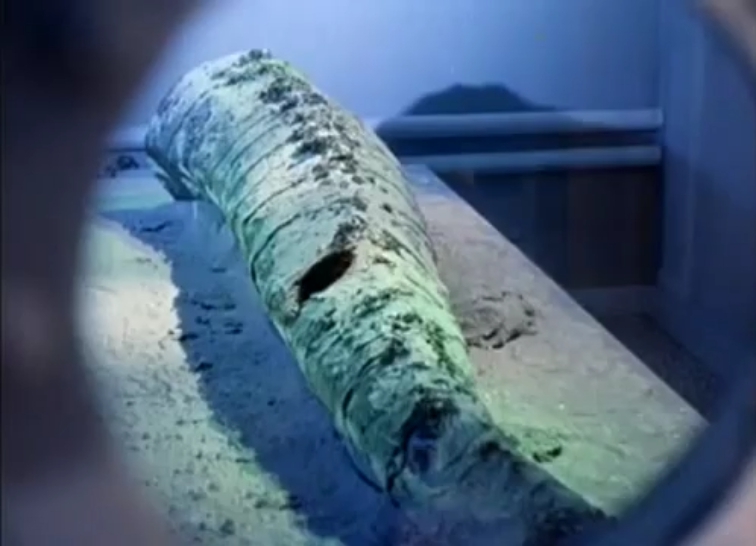 A portion is brought up on a drill, and through some scientific mismanagement, the creature manages to regenerate its entire body. The only version available to me is the English dub. The preliminary narratation feels like it was added, and the dubbed dialog is staid. Getting small glimpses of the Danish version (bracketing the Danish-exclusive flying scenes) convinces me that the original delivery, in Danish, has a lot more energy and character. Like the Godzilla franchise, the early protagonists are a scientist and a reporter, men of truth, loaning the plot credibility. 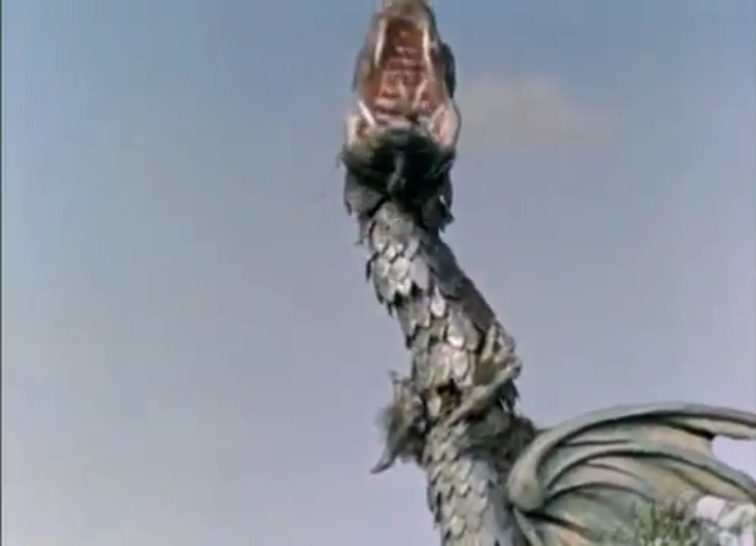 But that switches over to General Greyson when Reptilicus is ravaging Denmark. The film is places a comedy, with the lovely young women fighting over the handsome scientist, and Dirch Passer, a very popular comedian, was cast as the bumbling security guard. About a half an hour in, there's a five-mnute commercial for Danish tourism, includng a lounge singer extolling Copenhagen. It's not horrible, but it certainly stops the film cold. And it feels a little strange to tourish-shill for a city a giant monster is about to destroy. It should be said, however, that Japanese cities have apparently lobbied for their city to get stomped in the later Godzilla franchise films. Our first glimpse of the resurrected Reptilicus is about half an hour into the film, and we get our first good look at minute forty, right as the military starts sending a lot of ammo downrange. Reptilicus, like all self-respecting kaiju, is immune to shells and bullets. However, it can be lit on fire, and the military force a retreat by unleashing a flamethrower. This shows a very Western reliance on the military to solve problems. Although the science boffins are kept along as advisors, General Greyson is lionized as the military man who doesn't want the job, but delivers the final blow to the creature when all is ready. 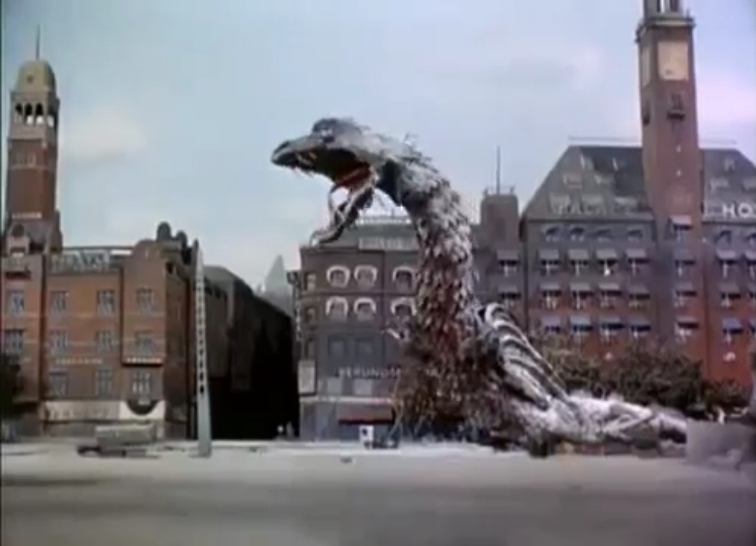 This was something that the 1998 American Godzilla suffered from, that conventional arms and armaments are able to deal with the gigantic mence, even if it isn't in the standard fashion. In a post-World War II country that has not reounced violence, this is understandable, but it removes some of the novelty of the monster. If conventional weapons can destroy it, then it's just a matter of deploying them, and the problem is solved. Pacific Rim sidesteps this by showing us human-made momsters, Jaegers, that were able to take on kaiju on their own terms. Reptilicus's cry/bellow is long and complex, and seems to include some sort of bell. It isn't strong enough to identify itself above the musical soundtrack. It's more like ambient sound when the monster is being shown, which is something of a relief after the ruacous and repetitive nature of The Giant's Claw's battle cry. The American Reptilicus has an acid breath that is not present in the Danish version. Once the viewer is aware of this, it's easy to see that it has been introduced post-production, because it never affects anything. Reptilicus vomits/spits a line of glowing green slime, then the screen gets covered by it, and the shot ends. Some dialog refers to the acid slime, but never we see any victims. I would like to see the Danish version some day, because it would be very strange to watch Reptilicus unable to strike back at the military, only destroying what comes within its short reach. Monsters are drawn to cities like college students to a keg, so Reptilicus heads for Copenhagen. Once it is there, it homes in on a famous landmark. It chooses the Børsen, which held the Danish stock exchange until 1974. We get an unintentionally funny moment as the spire, shaped like twining dragons' tails, balances on its head after falling. 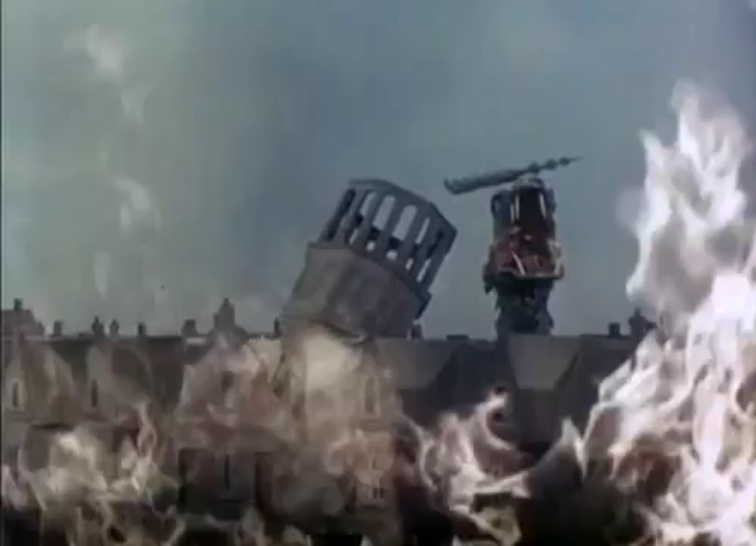 Reptillicus offers us only two very quick scenes of the destruction left behind by the monster, which could be stock footage sowing the aftermath fo a fire. The film clearly wants to be more of a fantasy film than a horror one, thrilling the audience rather than bringing up memories of bombing raids. There are plenty of scenes with fleeing crowds, but I couldn't help wonder what happened to all the bicycles that had been mentioned in the section promoting Denmark. Perhaps all the cyclists got out of the city earlier. Reptilicus is defaeted in a combination of the Kong and Beast from 20,000 Fathoms techniques; by drugging it, but delivered by a special shell. Of course, they've only made one shell, and they don't have Lee van Cleef to fire it. So the general has to, because being a high military rank means you're the best shot witgh a bazooka. But once Reptilicus is drugged and down in front of the Scandic Palace Hotel, the film ends. What are they going to do with 70 meters drugged regenerating pseudo-dinosaur? And, of course, there's a paw that was blown off earlier, so there was the possibility of a sequel. Following the success of 1998's Godzilla, director Sidney Pink attempted to make a sequel, but he died before he was able to. Reptilicus is a fun film, different from the kaiju films that preceeded it. Although uneven in tone, moving from comedy to military action to science discussion, it manages to cohere into a decent, if not spectacular monster film. 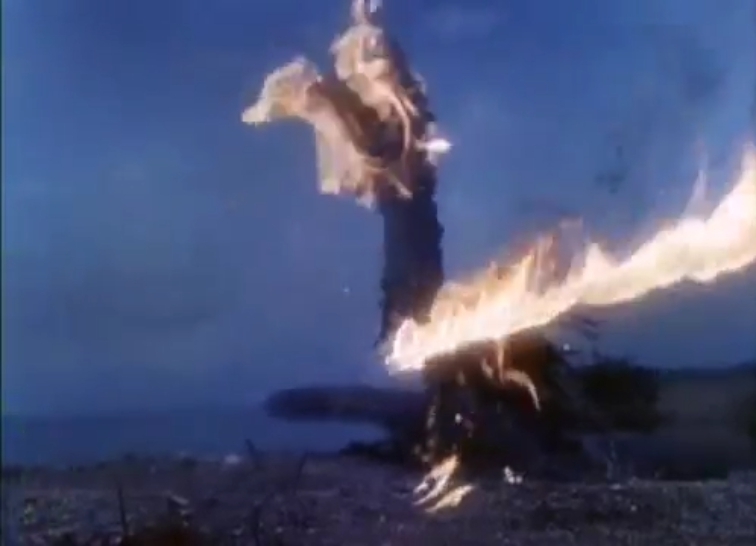 Certainly it's good to get away from the usual tropes, but it becomes clear each time a new film studio got involved with giant monster films that the Toho crew were spectacualarly good at their jobs, and the brilliance of monster-maker Eiji Tsuburaya is stunning. Next up, the most famous match in kaiju history, as the Big Ape and the King of the Monsters go toe to toe. Well said, John. Reptilicus is one of those rare gems of a film - on the surface another B monster flick, but scratch his scales and there is so much more there.